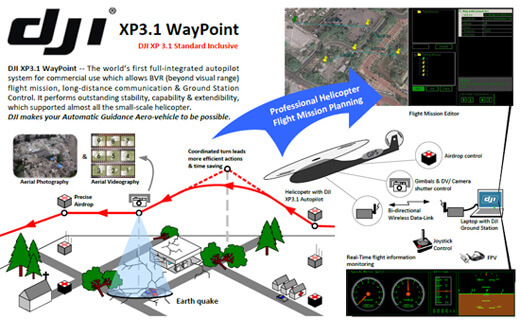 DJI XP3.1 WayPoint has issued new functions of automatic camera trigger and air drop. DJI XP3.1 WayPoint has issued new functions of automatic camera trigger and air drop. By setting up the extra general function servo channel, a user can edit and preset for repeating actions of camera trigger and air drop missions. To enable these functions, firmware update, Version 40406 is also issued. The new firmware provides more agile control feelings for users during flying under the autopilot mode. The helicopter will respond more swiftly, and a more powerful brake operation by pushing the control stick to an opposite direction (respective to the flying direction) is provided. Also, when switching between control modes, users will experience smoother performance. The new configuration software, Version 1.4.3 will be issued along with firmware Version 40406, and parameters settings will be slightly different from the older version. Configuration setting files saved from Version 1.2.2 or 1.3.3 will NOT be compatible with the new Version 1.4.3.